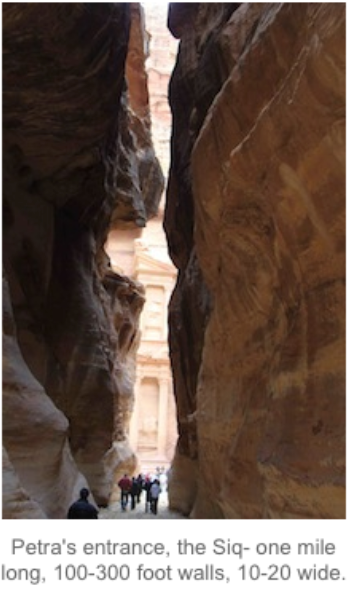 One of the new seven wonders of the world, Petra is incredibly fascinating – a place like no other. Located in southern Jordan, near the western border with Israel, Petra today is an empty city. tourists trek there each year from all over the world to see the jaw-dropping scenery. 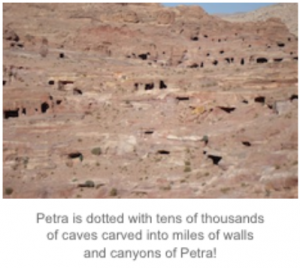 The following is a brief outline of the case for Petra as the place to which the Jews will flee in the middle of the coming seven year tribulation period. 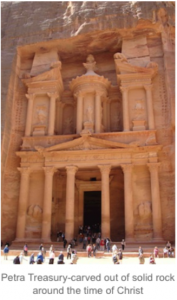 The time period when we believe Petra will stand tall in fulfillment of Bible prophecy is the last 3 1/2 years of the tribulation, the length of days described in Daniel 12:11. Israel’s promised peace, specifically agreed to be a seven year period (Dan 9:24a), will come to a screeching halt after 3 1/2 years (Dan 9:24b). Jesus describes it as the the worst day in the history of the Jews-past, present and future. Backing up to the beginning of the Tribulation, in the wake of the post-Rapture world crisis, a fast-rising and boastful world leader promises peace to Israel (Rev 6:2, Dan 9:27, Dan 7:8). This peace offer will include the right to rebuild their long lost but beloved Temple (Rev 11:1,2), which would allow the Jews to return to animal sacrifices for the first time in almost 2000 years. Israel accepts the ungodly peace offer, against the warnings of the Torah, and ultimately pays dearly for it (Mat 24:21). This takes place at a time when all the Jews in the world will have been forced to squeeze back into Israel, which is not very large, roughly the size of New Jersey. With 15 million Jews in the world today, that’s 10 million Jews murdered in one day– certainly qualifying as the worst day in the history of the Jews!! Also in the first half of the Tribulation, 144,000 Jewish evangelists will proclaim the good news of Jesus’ shed blood for sins (Rev 7:4; 14:6). Some Jews will listen, some won’t, and millions will die in one day. But the focus of this article is not the 2/3s who die, but rather, the 1/3 who escape, having heeded the warnings the 144,000 Jewish evangelists pointing to God’s Word. This is the literal fulfillment* of the famous “watch for the abomination of desolation” prophecies of the most important event in the future for the Jews. It is a sign to them to run as though their life depended on it-because it will! Only 1/3 of the Jews will escape the murderous hand of the antichrist. They flee with nothing but the clothes on their backs. 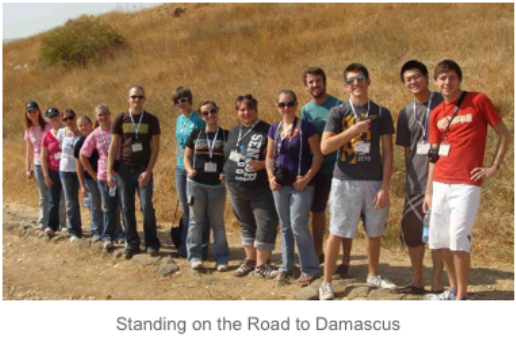 Those who are not hunted down (the last to get out of town) will eventually congregate in Edom, present day southern Jordan, in the area of Biblical Bozrah. It is here in the area of Bozrah that God has prepared a place for the surviving Jews to be protected from the anti-christ’s murderous hand. cell phones, cars, faxes, Internet, or money. God will provide them with food and water (Rev 12:6). They will loose their pride (Is 2:11). With all the distractions out of the way, the Jewish people, chosen by God for His purposes, will reacquaint themselves with their Maker. After 3 1/2 years, at the end of the Tribulation, their Messiah will present Himself to them there. know for sure where they came from, or what caused them to disappear seemingly almost overnight. But they lived there for about 300-400 years continually building and expanding a city called that today we call Petra (“rock”). Petra has only one entrance that is a mile long, roughly 10 to 20 feet wide, with towering cliffs above reaching as high as 300 feet. The long winding entrance, called the siq, opens up into open spaces and canyons large enough to hold 5 million people, when fully excavated. My my, what a coincidence that in the middle of Edom, in the middle of Bozrah, is a place just waiting to be used by God. A place He prepared 2000 years ago! Just as the Bible predicted. As we mentioned, Petra was recently designated as one of the “Seven Wonders of the World.” Few of the tens of thousands who trek to see Petra each year have any clue about the Biblical tie-in. But we try to make visiting Petra and option on every trip we take to the Holyland. Every Believer should go to Israel at least once in their life. Seeing what you’re reading in your Bible simply changes you. And when you go, if at all possible, try to include Petra. It will knock your-Bible-socks-off!!! 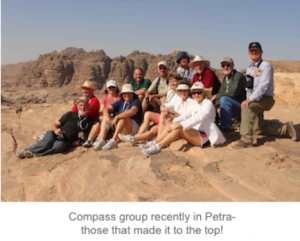 If you would like to print this article click here: Petra – Prepared by God?